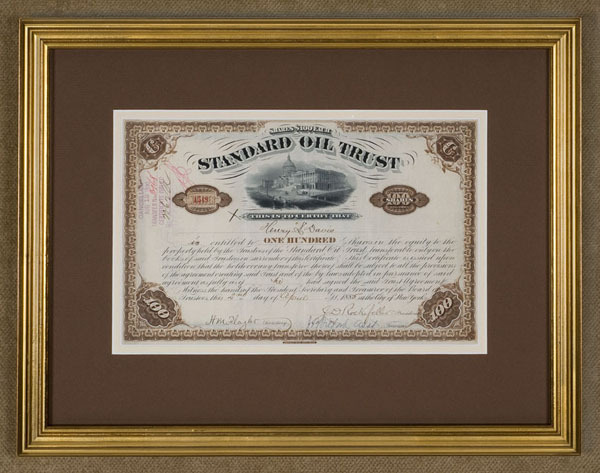 Standard Oil Trust Stock Certificate, printed in brown, for 100 shares Signed by John D. Rockefeller and Henry Flagler, April 2nd, 1885. A highly ornate partly engraved stock certificate Signed by John Rockefeller as President and countersigned by Henry M. Flagler as Secretary. 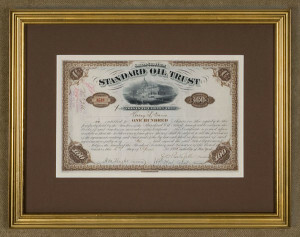 A scarce variety, printed in brown, black and white instead of the green, black and white known for Standard Oil Trust stock certificates, with an ornate brown border. There is an engraved vignette of the U.S. Capital building as on the green certificates, but the 100-share amount is elaborately engraved several times, rather than the share amount being entered in manuscript as on the green certificates. Excellent signatures which are only machine cancelled, with no pen cancellation line through them as is usually found. Henry M. Flagler was associated with Rockefeller in the development of the Standard Oil Company; he later organized the Florida East Coast Railway and built great hotels at Florida shore resorts. These 100-share certificates were probably designed to be used for large transactions, as “Shares $100 each” is engraved at the top; 100 shares amounted to $10,000, a substantial amount of money at that time. An oil entrepreneur and philanthropist, John Rockefeller began in oil refining and organized Standard Oil in 1870. Soon he gained a monopoly and twice the courts dissolved his trusts. As a philanthropist, he established the Rockefeller Institute for Medical Research and the Rockefeller Foundation. Framed (with a cream inner mat and a brown outer mat, in a gold frame) dimensions: 18 1/16 inches wide by 14 1/4 inches high.